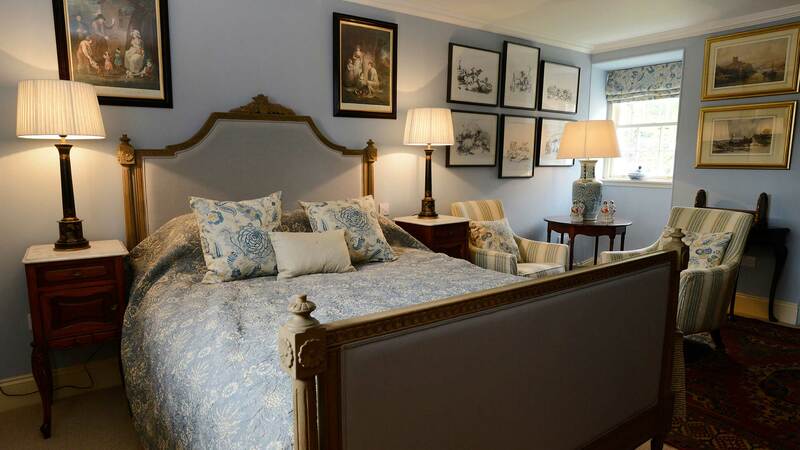 Each of the 22 en suite Guest Rooms have been individually styled with complete comfort in mind and feature carefully selected antique pieces. Guest Rooms enjoy all the modern facilities including LED Screens, WiFi, luxury Tea/Coffee making facilities and Arran Aromatics Toiletries. 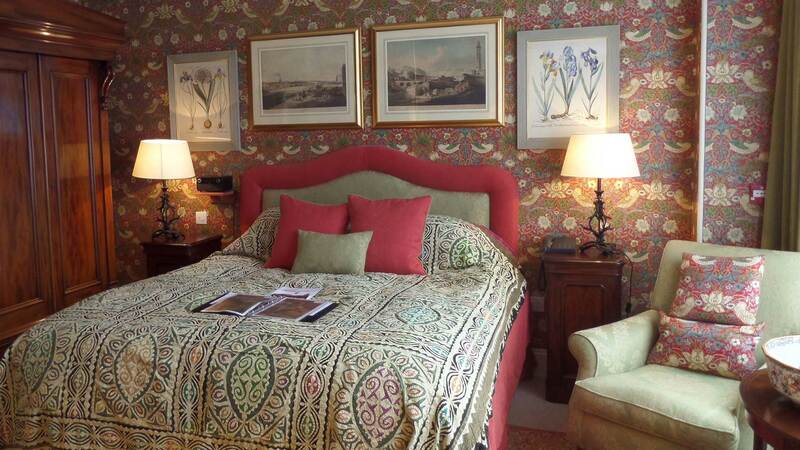 All Guest rooms can be booked online. 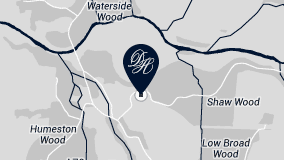 Please note check in time is from 2.00pm. With a bay window that overlooks open countryside, this is a clean, crisp yet cosy room situated to the front of the House with King sized bed and en suite bathroom with over-bath shower. 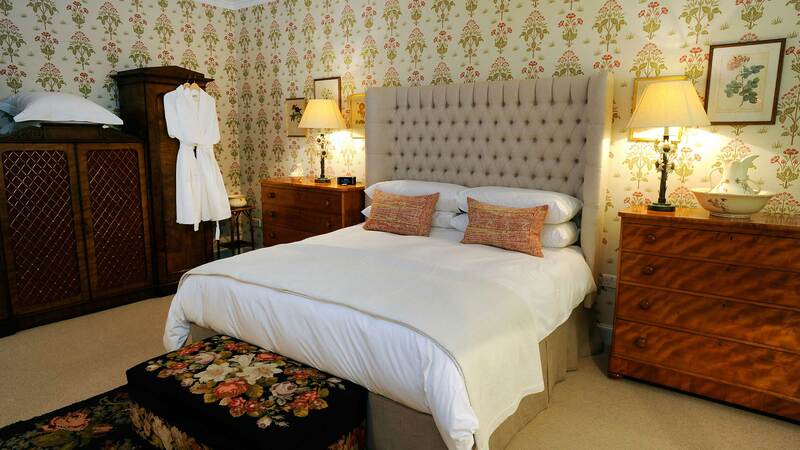 This room has a real country cottage feel to it with its luxury double bed and, with its carefully chosen fabrics and wallpaper giving you the comfort cosy feel. 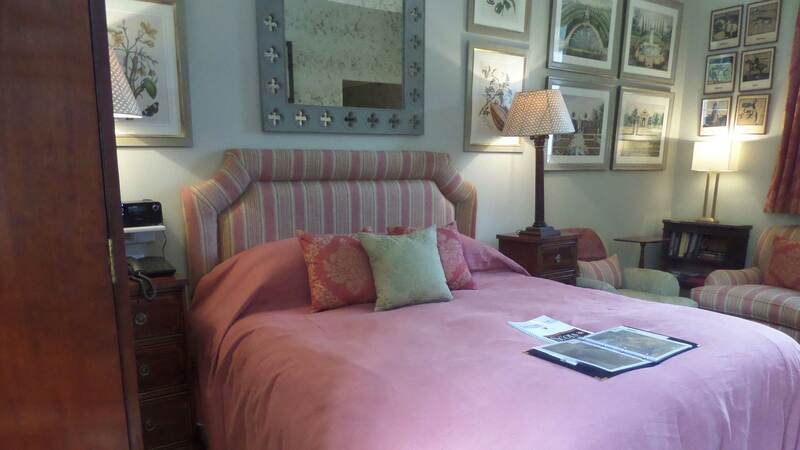 The en suite facilities in this bedroom feature a double shower only with no bath. 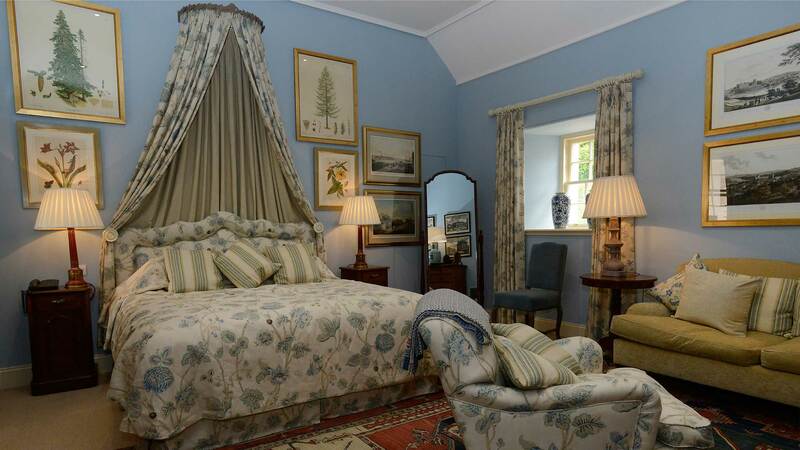 A rather grand country house room with an original 18th Century Alexander Peter Four Poster Bed and 19th Century Press and Drawers, both of which are from Dumfries House. The en suite bathroom is exceptional in size and features a free standing roll-top bath and separate shower. 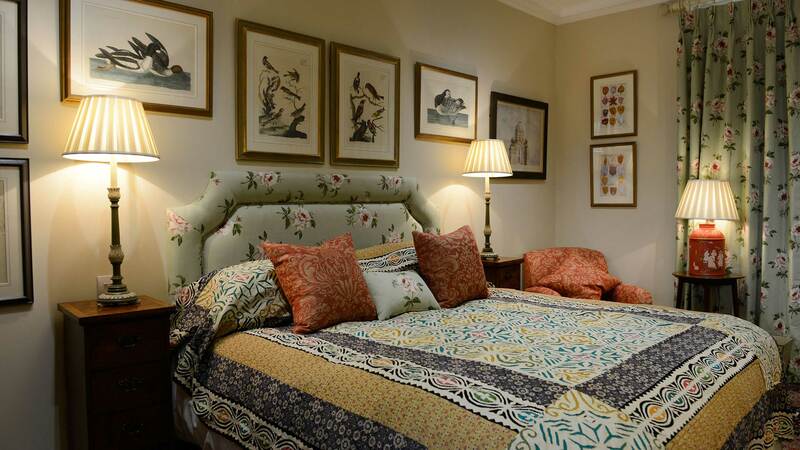 This bright and spacious room features a grand wrap-around cushioned and linen covered headboard bed and 19th century cabinets from Dumfries House. The exclusive bathroom features a double basin vanity unit, large bath and separate shower unit. Room 5 is up in the eaves of the house. 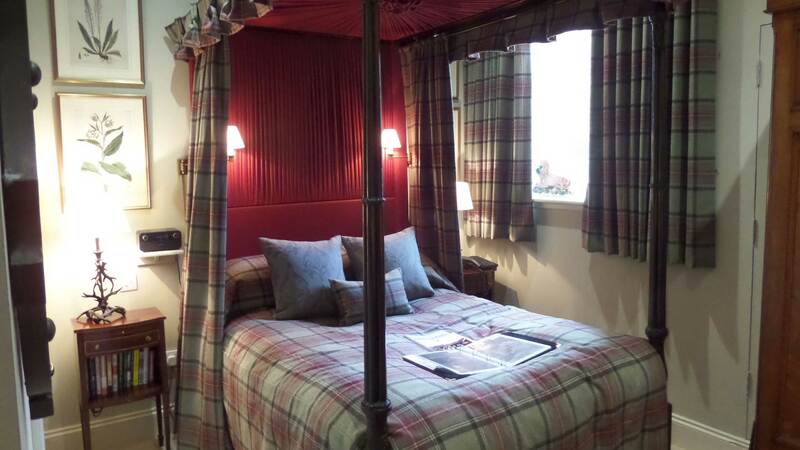 Styled with the moon tartan fabric throughout, Room 5 has a slight edge to it with its Moon tartan canopy giving it slight touch of elegance. 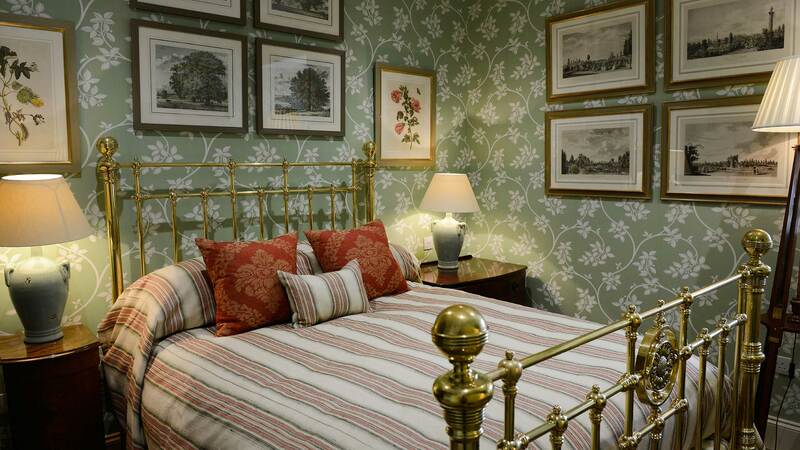 This is a quaint traditional themed bedroom with its Miniature 4 poster bed as the room's main feature, and beautifully selected moon tartan fabric dressings. Following on with a small en suite shower room. 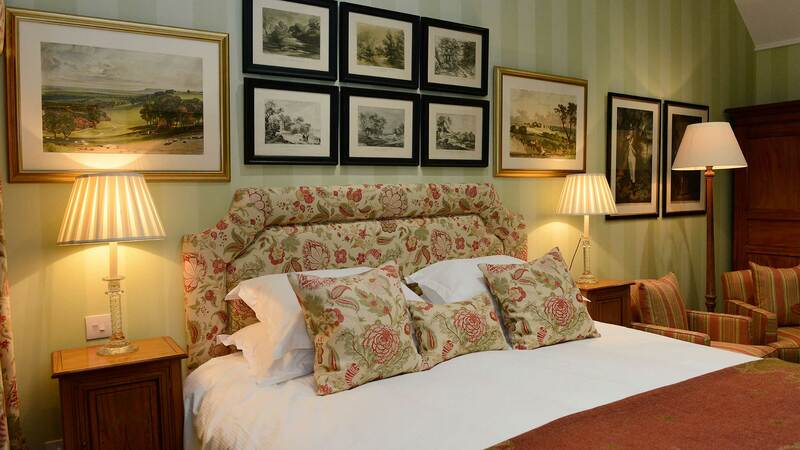 A luxury double bedded room complete with double patio doors that open and overlook on to the Lodge's beautiful courtyard gardens. A real country cottage feel. The en suite facilities feature a shower room. 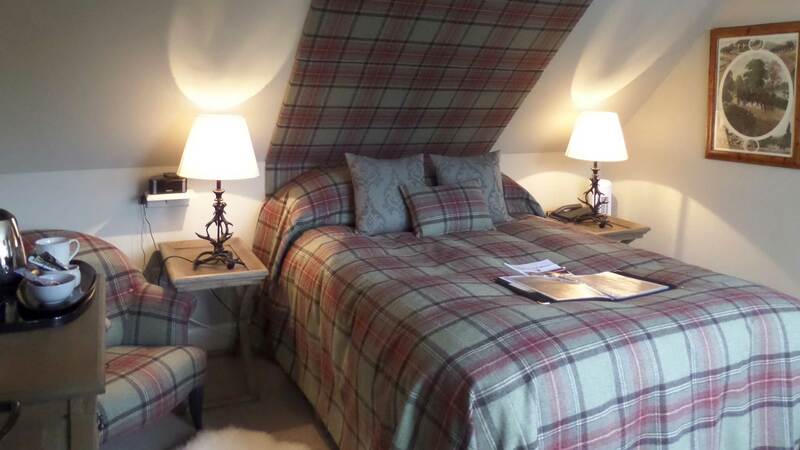 A bright and spacious superior double bedroom with another grand country cottage feel to it, still situated within the Lodge. An exceptional en suite bathroom complete with bath and shower. 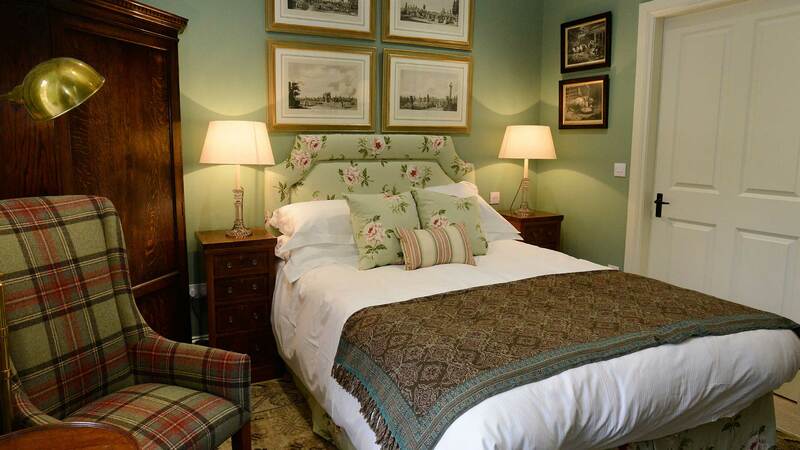 A crisp yet cosy luxury double room situated outside the Lodge overlooking the glorious courtyard gardens. Complete with en suite facilities featuring a shower room. 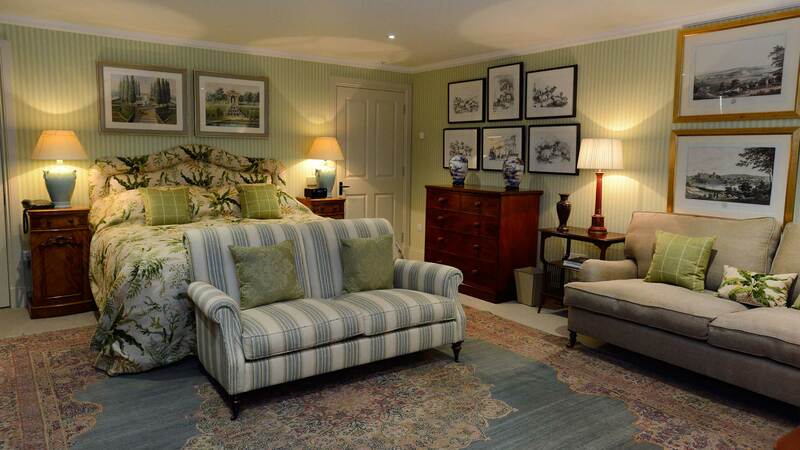 This bright luxury double room with its floral and green fabrics making this a crisp yet cosy room overlooking the courtyard garden. Complete with en suite facilities of a shower room. Along with rooms 10,11 these rooms all have private access from the same entrance and hallway. 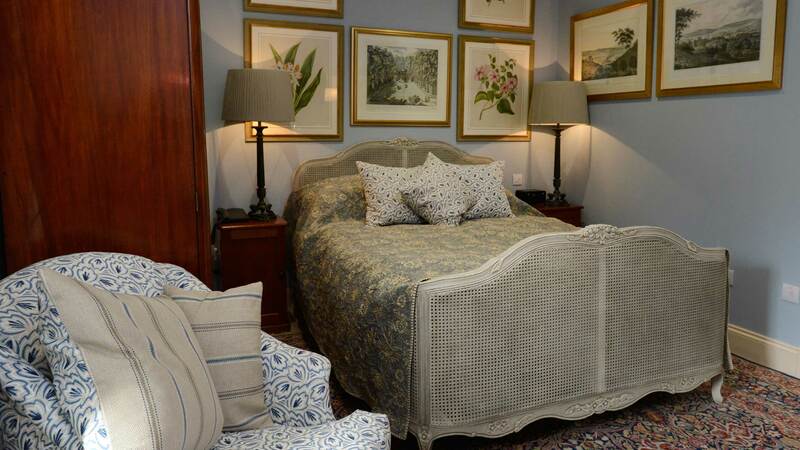 With their own private accesses and entrance rooms 13 and 14 both have that traditional country cottage feel these luxury doubles with their cosy and crisp feel. Both rooms contain an en suite shower room. A slightly more modern twist has been added to this room with its bright, spacious superior Double bedroom and its crisp clean cosy look room 15 is far superior than its sister rooms throughout the Lodge. The en suite features in this room include a bath and a hand held shower. 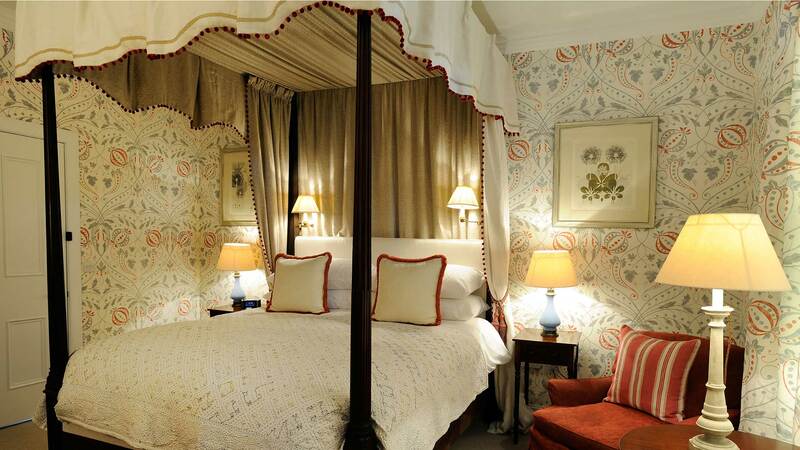 Very much like its sister room 15, room 16 is also a spacious superior double with the main feature of an overhead canopy with carefully chosen fabrics to match, making the room bright and spacious with an air of grandeur and luxury. Complete with a spacious bathroom complete with bath and hand held shower. 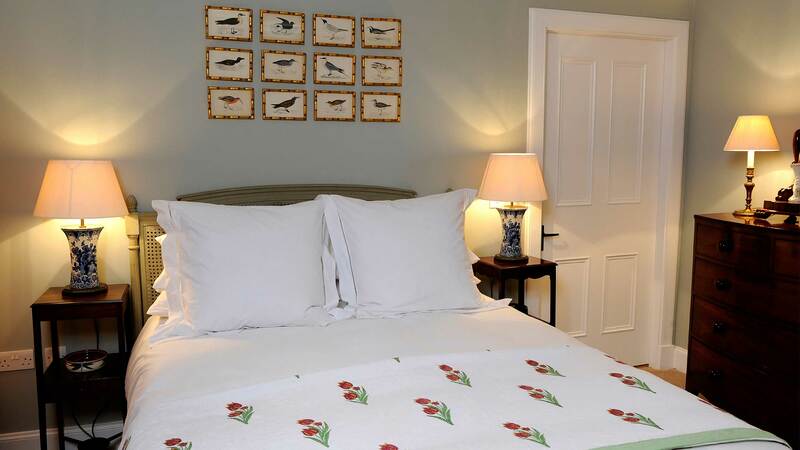 Featured at the rear of the Lodge, room 17 is also a bright spacious superior double room with a hint of a homely cottage feel to it. 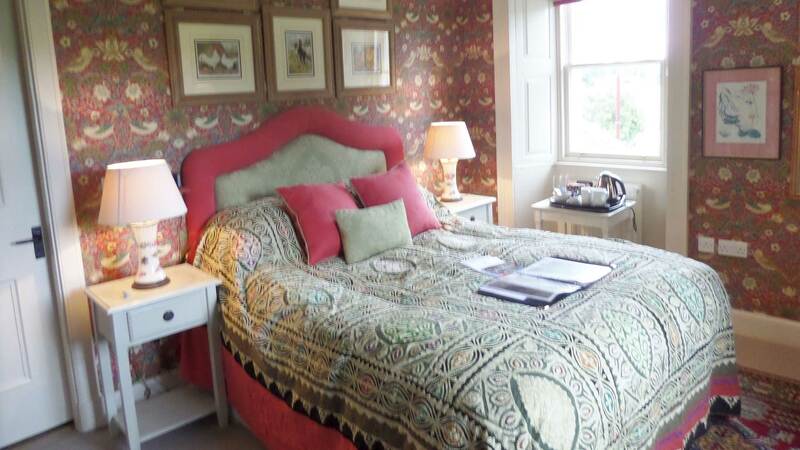 This room has also been adapted to make it suitable for guests with a disability, with its disabled parking access and the 2 bathrooms one of which is a fully accessible wet room. 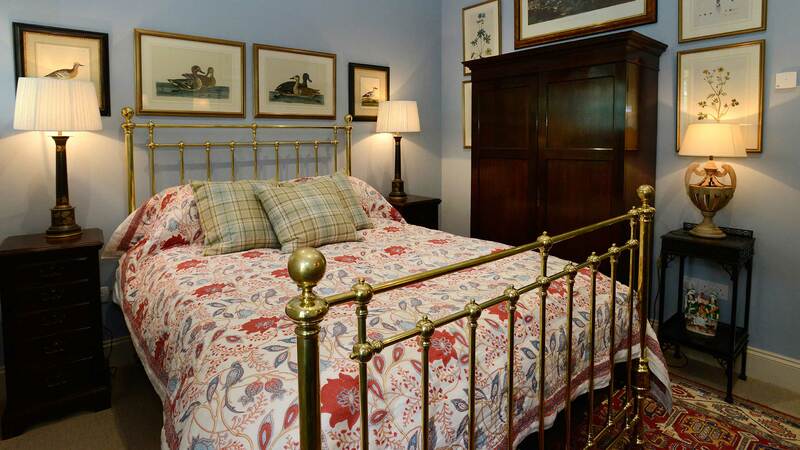 Containing a traditional style brass bedstead this luxury double is a home from home, with its country, cosy look making an ideal please to relax. Complete with an en suite shower room. 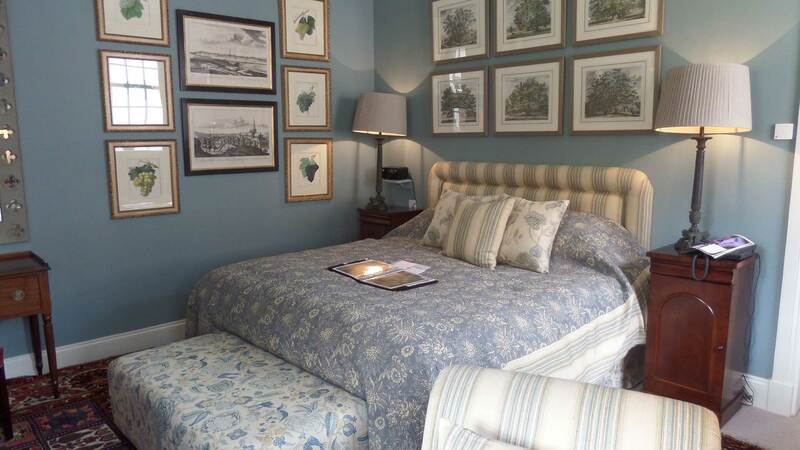 These bright luxury double rooms with their floral and blue fabrics design with a crisp yet cosy feel featuring a blue styled sleigh bed. Complete with an en suite shower room. Standing alone in the Courtyard bedrooms 21 and 22 are situated in the old Power House. Room 21 is situated on the ground floor whereas its sister room 22 is situated above, even though it has an attic style roof room 22 is a very spacious, modern styled room. The en suite features in both theses room are a bath and a hand held shower.